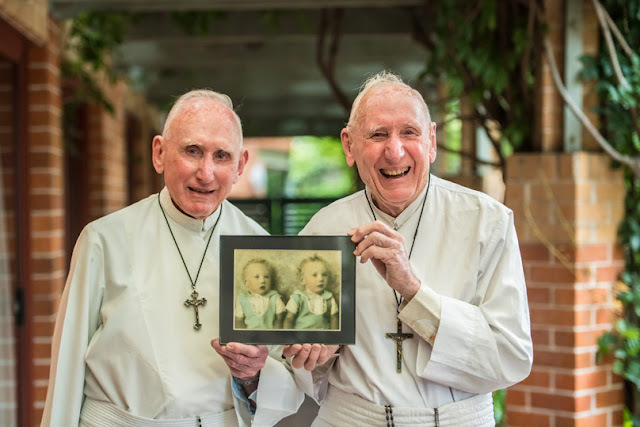 Catholic News World : Wow Identical Twin Brothers Celebrate 60 Years as Redemptorist Priests! SHARE their True Story! Wow Identical Twin Brothers Celebrate 60 Years as Redemptorist Priests! SHARE their True Story! Australia's Catholic Weekly reports that identical twins, Fathers Patrick and John O’Neill CSsR, now 86 year-old brothers are celebrating their ordaination to the priesthood together at the Redemptorist monastery in Ballarat some 60 years ago, on 16 March 1958. While growing up in Goulburn with their six brothers and sisters, Frs Patrick and John say they had a “wonderful” education from the Mercy Sisters during their primary school years, and the Christian Brothers at secondary school. They entered the Redemptorists’ minor seminary together at Galong when they were just 15 years old. During their novitiate years, the teaching staff decided that there could only be one vocation between the two of them and set about trying to determine which twin had the vocation. It was soon after ordination that the brothers truly went their separate ways. After studying together in Rome Fr John returned to Australia to teach in the seminary while Fr Patrick stayed on to continue his course in moral theology. Fr John eventually felt called to undertake missionary work in Africa and served at the Redemptorists’ mission in Burkina Faso for almost 22 years, only returning home after suffering a stroke in 2007. Meanwhile Fr Patrick served in a variety of roles for the Redemptorists including teaching, accounting and farm work at the minor seminary in Galong. But it was the three years of mission work in Townsville that he says were the “best years” of his life. Mission work has been the highlight of his vocation, he says. “That’s what we were ordained for.” When Fr John suffered the stroke in Africa, Fr Patrick flew to Rome to meet his brother there and bring him home to Australia. And so the brothers were reunited once more. They now live together at the Redemptorist community in Kogarah.